Thousands of rural Texas homes get their natural gas from "farm taps," hooking up to nearby pipelines that carry raw gas on its way from wells to processing plants. One homeowner shut down his furnace when he learned of the risks. SANTO – A stiff winter wind smacks into the plate-glass windows of Jon Salis’ Lake Palo Pinto home as six space heaters work overtime to keep it warm. Natural gas used to keep his 2,100-square-foot house cozy. In fact, Atmos Energy's gas service was one reason Salis decided to remodel a lakeshore cabin about 80 miles west of Arlington, and move here in 2001. Last summer, Salis learned that the natural gas flowing through his pipes isn't the fully processed, clean-burning fuel that most Texans picture. Rather, it's what he calls a "raw gas cocktail," tapped from a pipeline that runs beneath the lake on its way to a processing plant. The more Salis learned about the gas coming into his home, the more scared he became. Finally, Salis just turned off his furnace. Salis' neighborhood was hooked up to a natural gas pipeline decades ago through what's called a "farm tap." In years past, many utilities and landowners considered it easiest and cheapest to hook up rural homes to nearby pipelines that carry mostly raw fuel from gas fields to processing plants. Known as “wet gas” because it contains higher concentrations of liquids such as ethane and butane, the unprocessed gas is prone to freezing in cold weather and, in rare cases, can corrode appliances, causing them to misfire and potentially emit carbon monoxide, according to documents filed with the Texas Railroad Commission. No one knows how many Texas customers are hooked up to wet gas. The Railroad Commission regulates natural gas utilities and the state’s 426,000-mile network of natural gas, hazardous liquid and other pipelines, but doesn’t set standards for the gas pumped through them. Atmos, which serves more than 1.5 million customers in its Mid-Tex division, said that fewer than 200 rely on wet gas. The gas is ill suited to power homes, Atmos employees testified at a Railroad Commission hearing in September. But the company does not consider it “dangerous,” and none of its customers have reported related health problems, it told The Texas Tribune and the Fort Worth Star-Telegram. But Salis and his attorney, Michelle McFaddin, think Atmos and other utilities should be more upfront about the risks of using wet gas – even if some experts describe them as small. For the most part, the Railroad Commission focuses its health and safety efforts on the condition of the pipelines rather than the gas pumped through them. Texas law does not spell out standards for the quality of gas delivered to homes. Most residential gas is stripped of troublesome liquids in processing. But thousands of landowners over the decades negotiated to tap into raw gas when they allowed pipeline companies to build across their property. “The people, when they got it, were aware of the conditions,” said Bill Fowler, an attorney in Odessa who has represented pipeline companies. “A long time ago, they would strap a meter on anybody’s house." Now, Atmos and other utilities are seeking permission to turn off farm taps and convert neighborhoods to other fuels. In 2009, utilities filed seven applications to abandon wet gas service, according to Railroad Commission data. Last year, the agency received at least 23. In most cases, the companies call the services too expensive to maintain. But the companies occasionally face pushback from landowners. Some argue that shutting off service would violate contracts. Others simply don’t want to switch to other fuels. And at least one landowner told Atmos in another case that he wasn’t convinced that unprocessed gas was dangerous. The opposition included Salis – at first. He was alone among the nine homeowners in his subdivision to object when Atmos asked regulators for permission to shut off service. Atmos doesn't own the pipeline, which has changed hands over the years, but it owns the taps, meters and right to use it. The service connections “were made at a time when wet gas service was viewed more favorably,” Atmos said. 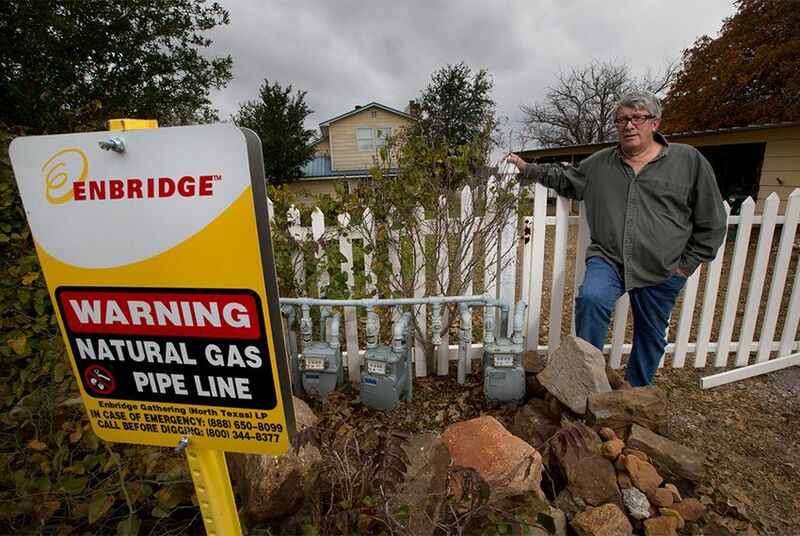 Salis’ eight neighbors readily accepted Atmos' offer last year to replace any gas-powered appliances with electric or propane items, which is cheaper than hooking up the subdivision to another natural gas pipeline. Salis rejected the deal, saying he wanted the company to consider hooking up his subdivision to alternative fuels. But he changed his tune after learning more about unprocessed gas in the Railroad Commission hearing that followed. Jesse Garcia, an operations supervisor for Atmos, testified that the gas was “not suitable for residential use” and described its potential for freezing. During cross examination, he said the gas had been “non-quality” ever since customers first requested service and can cause a “very irregular flame burning in your appliances” that could give off carbon monoxide. Garcia also testified that Atmos had not systematically told customers of those risks, but technicians may have done so during individual service calls to the area. The subdivision made 129 such calls in a year’s span, according to hearing documents, and that high number was likely due to the poor quality of the gas. Michelle Foss, chief energy economist for the University of Texas at Austin’s Center for Energy Economics, said such hazards are real but uncommon, and that many home appliances can handle the more energy-rich wet gas. Fowler said the overall safety record of unprocessed gas service is “exceptionally good.” He’s also never heard of carbon monoxide being a problem with the farm taps. Salis wants the Railroad Commission to make Atmos notify all remaining wet gas customers of the fuel’s risk, a demand the company has resisted. “Atmos Energy believes a general communication regarding the risks of wet natural gas would create more questions and confusion,” it said in an October brief. The Railroad Commission will decide if Atmos can abandon the service in the coming months. Salis said that day can’t come soon enough, but when all is said and done, he wonders how many others may be in the same predicament and not know it. This story was jointly reported by The Texas Tribune and the Fort Worth Star-Telegram. Editor's note: An earlier version of this story incorrectly identified the city of Santo as Santos.